For a character who is usually described as being “the black James Bond” John Shaft actually didn’t do a lot of stuff we associate with James Bond. John Shaft in his first two movies is a private investigator working cases strictly in Harlem. He doesn’t uses gadgets, he doesn’t take on world conquering supervillians. He doesn’t report to or take orders from anybody. That all changed with SHAFT IN AFRICA which turns John Shaft into an international action hero and I think it was the smartest move the producers could have done. By taking Shaft out of his turf there’s an element of real suspense and danger in this movie. We’ve seen in two movies that Shaft is unbeatable when he’s in his element. But in this one he’s halfway around the world and there’s nobody he can call for help and he can’t even really trust the people who are supposed to be on his side. SHAFT IN AFRICA starts off with a great sequence where Shaft is kidnapped by a gigantic African (Frank McRae) and his diminutive partner. Shaft is then subjected to a number of tests to determine if he can survive in the African desert. He passes the tests and only then does he meet the men who ordered his kidnapping: The Emir Ramila (Cy Grant) who rules over an East African country and Colonel Gonder (Marne Maitland) The two of them are working together to destroy a modern day slavery ring that recruits East Africans and illegally smuggles them into France. The East Africans are promised passports and wages enough to bring their families over but instead they find they’re working in sweatshops for barely enough money to buy food. Shaft is naturally (and quite sensibly, I think) reluctant as he thinks he’s way too Americanized to pass for a native African. But once he lays his eyes on the woman who’s to tutor him in African ways he changes his mind. And I can’t blame him. If Vonetta McGee was tutoring me, I’d change my mind in a quick fast hurry my own self. Armed with James Bondian gadgets such as a camera hidden in his walking stick which is his only weapon and a tape recorder in his tribal bag, Shaft gets himself placed inside the pipeline, allowing himself to be recruited and working his way up until he reaches the man in charge. But it’s a bloody trail as Shaft has been fingered by someone inside the Emir’s organization and he has to continually defend himself against assassination attempts. 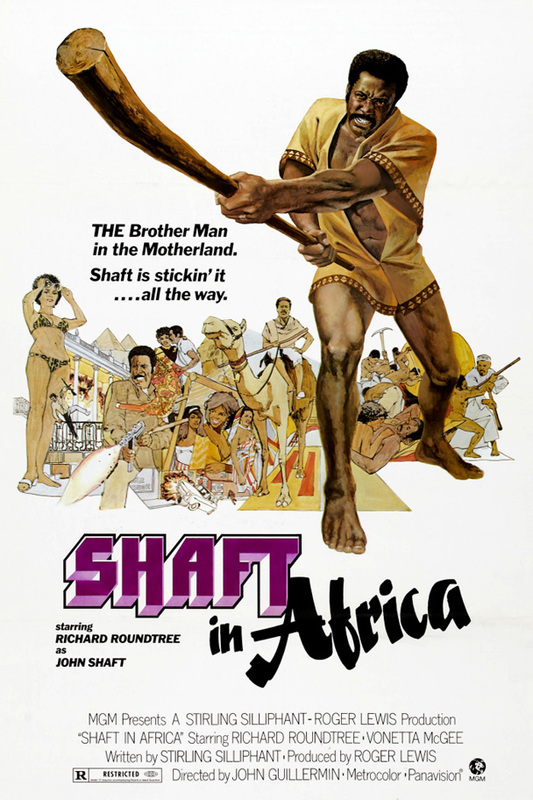 SHAFT IN AFRICA actually reminds me a lot of the novel version of “Diamonds Are Forever.” In that one, James Bond goes undercover and inserts himself into a pipeline of diamond smugglers. And like Shaft he makes his way up the pipeline by killing off the folks trying to kill him. And Bond has his Tiffany Case while Shaft has his Jazar (Neda Arneric) the nymphomaniac girlfriend of the supervillain Amafi (Frank Finlay) who is the mastermind behind the slavery ring and a lot of other nastiness besides. Richard Roundtree by now can slip into John Shaft’s skin with no problem but I like how he still brings new shadings and reveal of character. In Africa Shaft seems to become a new man. While he states flat out at the beginning of the job he’s doing it only for the $25,000 fee he’s contracted to be paid we see along the way as he follows this slave pipeline of misery that it changes him. There’s a thirst for justice and retribution that is reawakened in his spirit that has been dormant for too long. 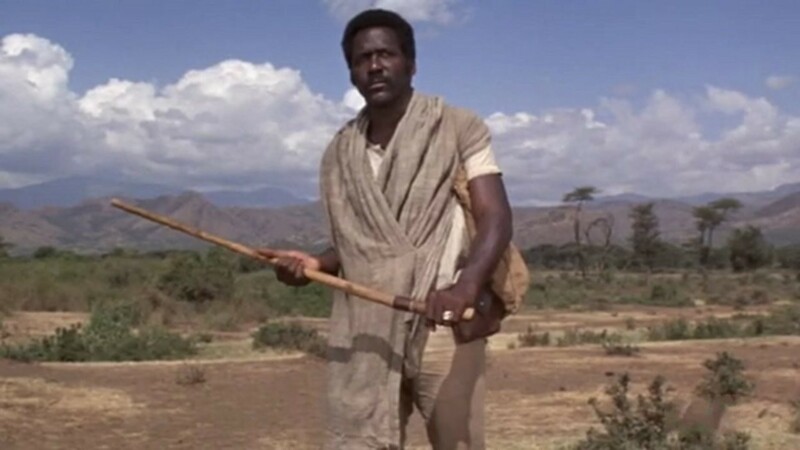 Vonetta McGee is deliciously wonderful and the conversation she has with Richard Roundtree about ritual tribal female clitoridectomy has to be seen to be believed. Modern day movies love to pride themselves on how mature and adult they are. But we’re talking about a movie made back in the 70’s where a black man and black woman talk freely about ritual tribal female clitoridectomy. I don’t remember a movie made in the last twenty five years (by white OR black filmmakers) that even approached such a subject. It’s always fun to see Frank McRae in a movie and this is one of his early roles and he’s a lot a fun to see in anything he does. And after the urban hellscapes of 1970’s New York in the first two “Shaft” movies, the clean wide open spaces of Africa and the international flavor of France gives SHAFT IN AFRICA a truly different look and feel. After the kinda so-so “Shaft’s Big Score!” SHAFT IN AFRICA is exactly what the series needed and I think that if the movie series had continued instead of going to TV, John Shaft would have grown into the sort of international action hero James Bond is. It’s a great movie and well worth your time seeing. Enjoy.